Born in Paris in 1848, Guay received his formal training in the studio of Jean Leon Gérôme. He began exhibiting at the Paris Salon in 1873 and specialized in history, allegorical, portrait and genre scenes. True to his Academic teachings, his works were finely detailed and his figures were accurately portrayed. Guay was awarded the Third Class medal at the Salon of 1878, a Second Class medal at the Salon of 1889 and the Legion of Honor in 1892. 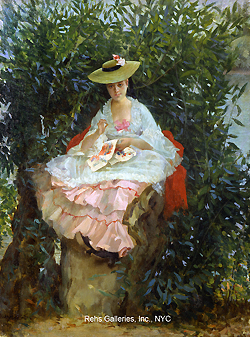 Among the numerous works he exhibited at the Salon were: Mater Amabilis (1881); Souvenir de Veules (1881); La Source (1882); Cosette (1882); Le Lévite d’Ephraim (1884); La Colombe Blessée (1885) and Mon Vieux Voisin (1890). 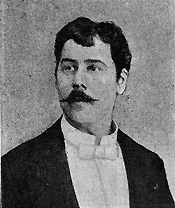 Guay also participated in both the Universal Exposition of 1889 and 1900 – winning Silver medals in both.